Buying a shed isn’t a small purchase, so you want to ensure you’re buying a shed of superior quality that will last. By asking a few key questions, you can learn a lot about how long your shed will most likely last and about the company you’re buying from. What are the sheds made of compared to what others in the industry use? -What materials are used to make the shed? -Is the roof vented? Does it have a vented ridge? -What keeps the floor from being damaged when you move the shed? When purchasing a Cook Portable Warehouse, you can find these answers easily by talking with any of our dealers or right here. Or, take our Dare to Compare Checklist with you while you shop to see how other options measure up. What warranties or price guarantees are available on the new shed? Make sure you understand the warranties before you make your final purchase. With any Cook portable building purchase you will receive a lifetime warranty on all treated components. There is also the option to upgrade your warranty, read about these options. Cook also offers a price guarantee! If you find any same-size building offering all the Cook features listed in our Dare to Compare Checklist at a lower advertised price, now, or even up to six months following your purchase, Cook will reduce their price by 50%. See all the details! Who will be delivering the shed? Who will be in your backyard? Your home and land is your private space. When you purchase a shed, always ask who will be delivering it and their connection to the shed company. When you purchase a Cook shed, a Cook driver will deliver your shed. Cook does not contract out this part of the buying process. Cook drivers are uniformed and have passed criminal background checks, motor vehicle report reviews, drug screenings, periodic check-rides and medical certifications. 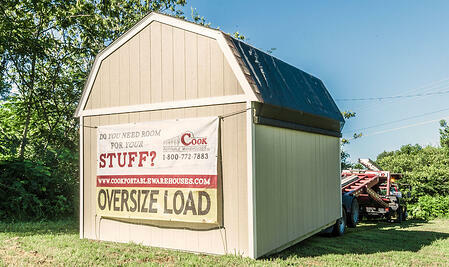 Cook employs superior personnel so you can feel comfortable when your shed is delivered. If there is an issue with the building after it’s delivered, who do you call? When you purchase a warranty for your shed, be sure to ask who you call if you need an issue fixed. 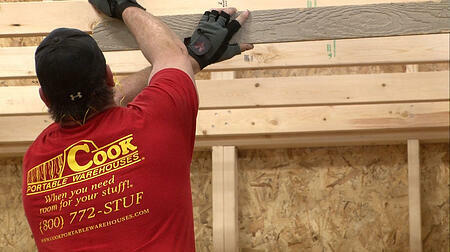 When you purchase from Cook, call Cook Portable Warehouses! In the unlikely event you have an issue with your Cook portable building, Cook quickly responds with a fully trained maintenance team supported by retrofitted service trucks and trailers. Can you talk a little about the shed company? Do you know who you’ll be buying from? It’s always good to know who your money is going to support. Wouldn’t it be nice to know the company you’re supporting, supports you back? Cook Portable Warehouses promises to be a compassionate corporate citizen. Their division called “Cook Cares”, oversees philanthropic endeavors for the company. This includes supporting organizations such as St. Jude Children’s Research Hospital, Corporate Angel Network and the Veterans’ Airlift Command. As you’re searching for a new shed, be sure to buy one that is made well but also fits your family’s needs. If you want to understand more about why the Cook Difference really is different, read more here. See the Cook Difference for yourself with this free download!